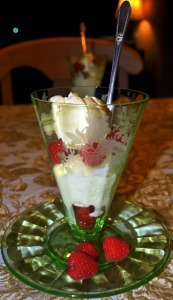 This week’s French Fridays With Dorie challenge is for Olive Oil Ice Cream. If ever a thing sounded incongruous, this is it! I couldn’t imagine such a thing – how could oil be creamy? I set aside my skepticism and decided forge ahead. After all, I never expected to like Olive Oil Cake, either. Dorie recommends using a fruity olive oil, so I used Pasolivo’s Lime Olive Oil, and I’m glad I did. I think the ice cream may have been a little bland without the subtle essence of lime. I also thought the ice cream could use a little color, so I layered it with these beautiful fresh raspberries. Somehow, the cooked custard blended perfectly with the olive oil to create a truly creamy ice cream – it wasn’t oily at all. The verdict: we liked this far more than we expected to, but it’s not out favorite of all the ice creams we’ve made since we got our ice cream maker last summer. 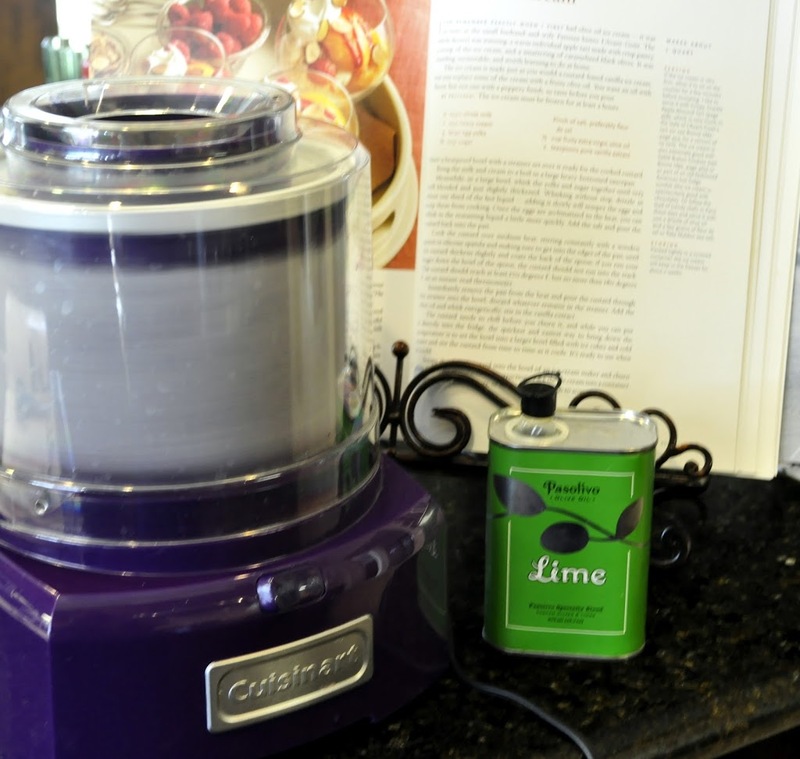 I’ve never tried olive oil ice cream but it sounds delicious – so does your lime olive oil! I went the other direction and used the spiciest olive oil I could find. Then I took it back to fruity with a lemon oil drizzle on top. I enjoyed this more than I expected. Its a tough sell but it shouldn’t be. But who wants to to work hard to sell ice cream as a dessert in your own home. I’m going to use up whats left tomorrow with balsamic and strawberries. My verdict was pretty much the same. Good, but with so many other options for my ice cream maker, I don’t see this one making a repeat appearance. Those raspberries look PERFECT. 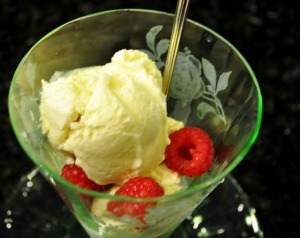 I liked my Meyer lemon olive oil ice cream a lot. The oil was so strong I opted to cut out most of the vanilla extract. I’m surprised it was bland because it felt like two teaspoons of vanilla was a lot. Maybe use a vanilla bean next time? The lime oil sounds interesting. 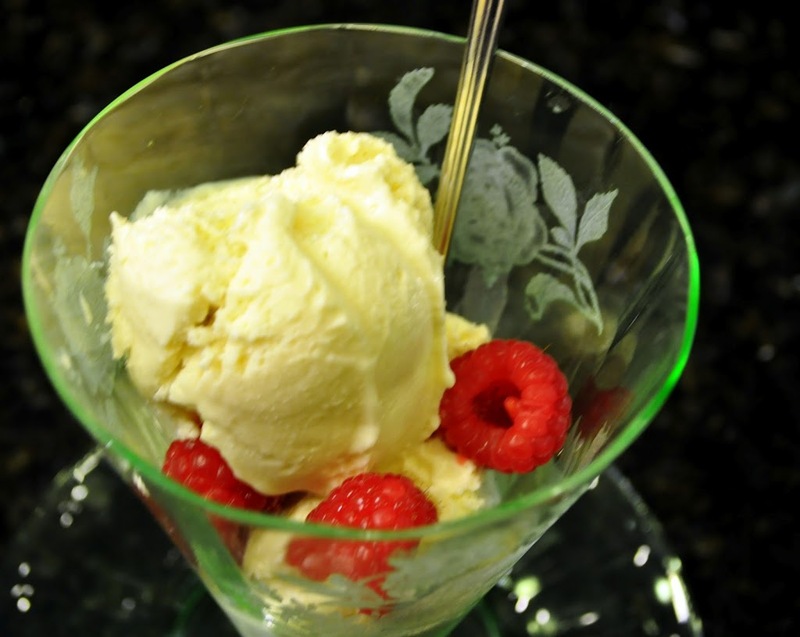 Your ice cream is so pretty with the raspberries! I’m intrigued by your lime olive oil. I’ve never tried it! Lime olive oil… never heard of it but it sounds fantastic for this recipe. Lime ice cream would be a new experience for me too. I’ll have to keep an eye out for lime olive oil. I’m so intrigued with this recipe…. Nice choice of flavors, complemented beautifully by your plating in the lime green glass! Enjoy your weekend, too! Your ice cream looks so pretty with the berries. I have not tasted Lime Olive Oil before but it sounds so tasty. I hope you have a great weekend. I agree, not oily at all, but definitely rich, in a yummy way. The raspberries make a pretty addition. 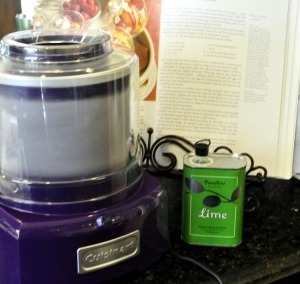 Love the idea of lime olive oil…I’m sure it added a wonderful flavor! Beautiful presentation!! Have a great weekend, Susan! Nice idea, Susan, I love the taste of limes and I am sure that the oil that you chose was very nice in this ice cream – and your beautiful green glass serving dish even matches the color of your cute green Lime Olive Oil can. Very nicely done! P.S. :I was sorry to read that you dropped out of the TwD group but your FFwD and Baked posts are wonderful! I am with the others who are loving your lime olive oil. As I read all of these posts this week I think Nana and I need to get out and go shopping again for some fun ingredients !! That said, while we were pleasantly surprised (code for “shocked”) at how yummy this recipe was…..I am in your camp on it probably not making it to the short list for the ice cream maker this summer. But loved the experience nonetheless. And great job with the berries- what a pretty photo ! It looks lovely and I’m also putting my vote in for lime olive oil – it sounds intriguing. I finally got ’round to making this last week – it was delicious, but I agree with you, it’s not going to become a go to recipe. I think it would be quite difficult, Susan, to do better than Brandied Cherry Chocolate Chip Ice Cream so I wasn’t surprised that this week’s ice cream choice didn’t go to the top of your list. Although my two granddaughters finished the entire batch last Friday night (they weren’t even tempted by the Ben&Jerry’s quart in the back of the freezer), I think this is a rather sophisticated taste and a little goes a long way. A scoop to dazzle the dinner guests. I wish I were near to participate in your book club also. I wrote an entire Post last December about being book clubless (http://www.lightsonbrightnobrakes.com/book-clubless-in-las-vegas/). Now that I will be in Aspen more, I think I’ll be able to re-connect with my group. I love G. Brooks but have not read this one about the plague. It’s in my stack, however. I think you may be like me – I cannot read something on my Kindle or iPad – I have to have the damn book in my hands. I’ve tried several times, cannot do it.